Before we discuss the causes of back pain, it will help you to understand the bones, nerves, and muscles in and around your spine. An abnormal function of the vertebrae, disks, ligaments, muscles, and nerves coming out of the spine may cause pain. Cervical spine: these 7 vertebrae support the neck. Thoracic spine: these 12 vertebrae are attached to the ribs in the chest. Lumbar spine: these 5 vertebrae are the lowest and largest bones of the spinal column. The sacrum, a shield-shaped bone, connects your back to your pelvis. The coccyx (tailbone) is at the end. It consists of tiny vertebrae fused together. The lumbar vertebrae bear more of your body's weight and stress than any other part of your back. Therefore, this region (the lower back) is the most likely to get injured. Each vertebra is referred to by a particular letter and number. The letter is the region (C=cervical, T=thoracic, and L=lumbar), and the number specifies the vertebra within that region. 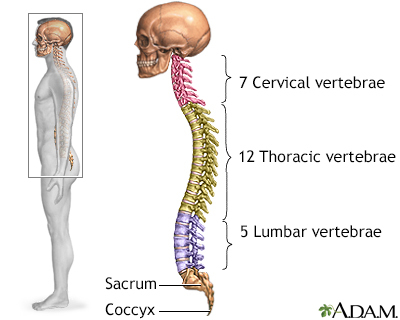 For example, C4 is the fourth bone down in the cervical region, and T8 is the eighth thoracic vertebra. If you reach around and feel along your spine, you would be touching bony projections along the back of the vertebrae. These are called spinous processes. Your doctor counts these (C1-C7, T1-T12, and L1-L5) to tell from where your pain and injury may be coming. Imaging tests, like an x-ray or MRI, may be used to pinpoint the location and cause with more certainty. For example, you may hear your doctor say after the exam that "your pain is between L3 and L5." After an MRI, the doctor may indicate the precise location and nature of the problem. For example, "you have a herniated disk between L4 and L5." Between each vertebra is a disk that cushions and protects it. 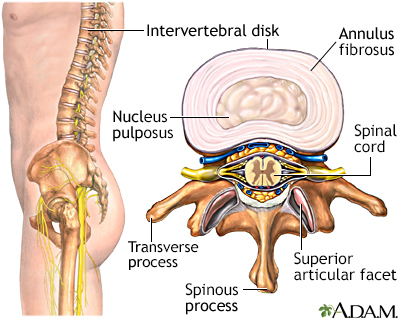 The outside of the disk, called the annulus fibrosus, is largely made of cartilage. The inside of the disk, called the nucleus pulposus, is a jelly-like substance that contains a lot of water. 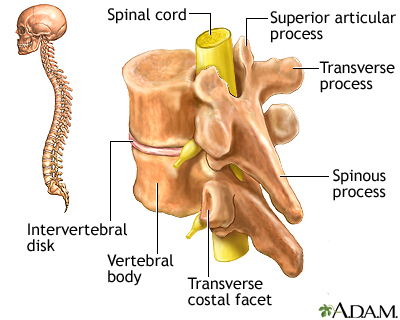 The vertebrae and disks of the back are surrounded by numerous muscles (called paraspinous muscles) and ligaments. These provide strength and support for movement, including lifting and bending. They are often referred to as soft-tissues because they are not hard, like bone. Stomach and chest muscles also support your back. When these muscles are strong and well-conditioned, they help reduce the stress on your lower back by redistributing weight. Most people fear that they have hurt their spine or disk when they experience back pain. That is much less common than straining your paraspinous muscles or other surrounding soft-tissue. The spine is surrounded by a surprising number of muscles and ligaments at different levels. These give the spine great strength. 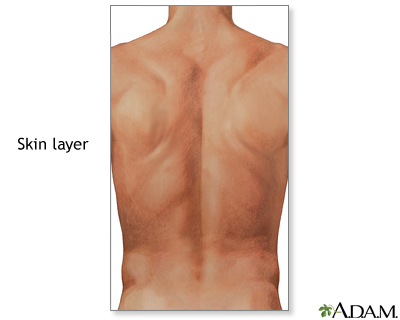 Click each button above to see different layers of muscles, tendons, ligaments, and bones of the back. Reviewed By: Andrew W. Piasecki, MD, Camden Bone and Joint, LLC, Orthopaedic Surgery/Sports Medicine, Camden, SC. Review provided by VeriMed Healthcare Network. Also reviewed by David Zieve, MD, MHA, Medical Director, A.D.A.M., Inc.